1. Begin with faith or values. Many faith traditions have teachings on taxes and economic justice. Judaism has long preached about justice, and a just social order. The word tzedakah is connected to the obligation we have to make acts of financial charity towards people who are poor, carrying with it the idea that wealth is from God, and those with financial means have the responsibility to ensure those who lack resources are cared for and given the opportunity to eventually succeed on their own. From the same religious foundation, Christianity embraced the ideals of social justice preached by Jesus. Early Christian communities stressed collective well-being and called upon one another to sacrifice for those who were poor and marginalized. Often, they created funds from community collections in order to provide goods and services to the widowed and poor. Most Christian religions continue to emphasize just economic practices and acts of charity. Islam upholds the practice of Zakat, one of the five pillars of Islam. Initiated by the prophet Muhammad, Zakat is the obligation to give a portion of one’s wealth out of concern for those who are poor or dispossessed. In addition to its obvious use on earth, Zakat is seen as necessary for one’s salvation. 2. Discuss options for our tax system. There are three main types of taxes. Tax Expenditures encourage certain activities and benefit certain groups, and they come in three basic forms: deductions, exclusions, and credits. Not all tax expenditures are bad — the Earned Income Tax Credit (EITC) lifts more families out of poverty than any other program, but others give wealthy corporations a sizeable cut on the taxes they pay that contribute to the common good. The issue is that the government doesn’t count expenditures in the budget. Since these aren’t listed as expenses they’re often overlooked. Once a deduction is written, the money we could have collected is largely forgotten and the money we miss out on could lead to belt tightening and cutting in places that aren’t really at fault. 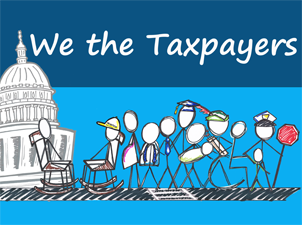 Whether it’s a public good that we all benefit from or a program that benefits certain groups, our tax revenues care for the common good in our nation and across the world. Many of the programs funded by our taxes go to providing services or care for the marginalized that our different faith traditions call us to care for—those who are poor, sick, hungry, or otherwise vulnerable. It really is up to us to decide what we want to do with our taxes, and the way we spend our tax dollars reflects our priorities as a nation. Start a conversation with a neighbor, family member, or friend about how our tax system can best provide for the common good. This entry was posted in Front Page, Spirit Filled Network, Taxes on August 21, 2017 by lily.